Today on this day in 2012 the Jets announced the signing of LaRon Landry . He played safety for the Jets in 2012. 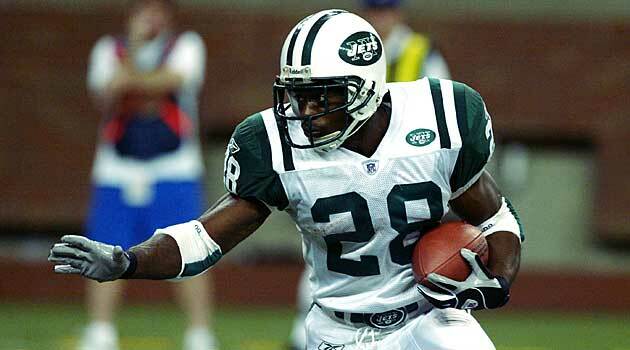 The Jets signed restricted free agent RB Curtis Martin to an offer sheet that the Pats were unable to match. The contract contained a poison pill provision which would make it nearly impossible for the Pats to match. On the surface, it was a 5-year $28 million contract offer with a team option for a 6th season. But included in the contract was a provision that offered Martin the opportunity (within 30 days of signing) to void all but the first year of the contract. The Jets further agreed that they would not use either the franchise or transition tags on Martin. This meant that if the Pats matched the Jets offer, Curtis would have the opportunity to void all but the first year of the contract - he would be paid $4 million in 1998, and become an unrestricted free agent in 1999. Without the ability to tag Martin, the Pats would risk losing him with no compensation after the 1998 season. By not matching the Jets offer, the Patriots received the Jets first and third round picks in the 1998 draft. Curtis remained with the Jets for 8 seasons, becoming the team’s all time career rushing leader with 10,302 yards as a Jet. He also has the 3 highest single season rushing totals in Jet history including a league leading 1,697 yards in 2004. New England set out to replace Martin using the two picks they obtained from the Jets to select running backs in the upcoming draft. With the first round pick they drafted RB Robert Edwards from Georgia. Edwards gained over 1,100 yards in his rookie year and appeared to be on his way to a solid NFL career, until he agreed to play in a Rookie Flag Football game in the offseason. He tore his knee up in that exhibition, tearing 4 ligaments and suffering nerve damage, effectively ending his career after it had barely begun. He tried to return with the Dolphins in 2002, but ony managed 20 carries before retiring for good. With the 3rd round pick, the Pats selected Michigan RB, Chris Floyd, who only gained 33 yards on 14 carries during his 3-year NFL career. wow a day with three good things. landry was pretty good at safety. it's too bad he only stayed the one year and moved on to greener pastures. the uniform change was great. those all green helmets of the 80's were pretty darn tacky as were the uniforms in general. the older style uniforms just have that classic look about them. as for martin, what can be said. the guy was very good at all aspects of his game. he could run well, had great hands and knew how to pass protect. wow a day with three good things. landry was pretty good at safety. it's too bad he only stayed the one year and moved on to greener pastures. The best thing Landry did was light up that salas dancing prick Cruz. He acted tough when it happened, but he was never the same going across the middle. Hopefully, the same thing happens to that douchebag Beckham.